When you’re dealing with missing teeth, life just isn’t the same. Simple things like smiling with confidence and chewing food with ease become memories of the past. The best form of restoration is dental implants in Bloomfield Hills, but there are several myths about them that have surfaced that could contribute to patients being apprehensive. The best way to dispel these mistruths is to counter them with facts, so as you read on, your local dentist dissolves the myths and provides the truth about dental implants. Let’s start by establishing a definition of what dental implants are. They are surgically inserted titanium posts that attach to your underlying jawbone and fuse with your existing bone over time through a process called osseointegration. As this phase of the treatment completes, you’re left with a sturdy foundation for a permanent restoration (crown, bridge or dentures) to attach to. With the many advancements in the world of dentistry, the process has become seamless. Still, mistruths exist about the procedure. One of the main concerns people have is whether the recovery process will be painful. Most patients are surprised to find out that the discomfort is not nearly what they thought it would be. With the sophisticated techniques for sedation and anesthesia now available, patients experience a more comfortable treatment process. The dental implant process is the most natural-looking form of restoration available. That’s because the posts attach to the jawbone just like the roots of teeth do. 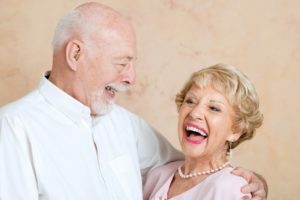 Whereas traditional dentures, which rest above the gums, can look artificial, implant-supported fixtures provide a much more natural appearance. The overall success of dental implants is 98 percent, so the chances of a rejection is highly unlikely. Furthermore, working with an experienced dentist provides an added safeguard against such a problem. A trained specialist will be on the lookout for any issues that could compromise the implant like gum disease or the use of tobacco and will advise as needed to make corrections before the treatment starts. Your new implants will require no more work than your natural teeth. Thus, you’ll simply brush and floss twice a day as normal to maintain them. Furthermore, you’ll be able to eat all the foods you want. With the constant advances in the world of dentistry, what may have seemed complicated in the past is now made simple. With the help of your dentist in Bloomfield Hills, you’ll be able to enjoy a fully restored and beautiful smile for years to come. To learn more about the process, reach out to schedule an appointment today. Dr. David G. Banda earned his dental degree from the University of Michigan and later completed the Implant Surgical and Prosthetic Program at The Misch Implant Institute. He still strives to learn more and further hone his skills through such organizations as the International Congress of Oral Implantologists. Dr. Banda restores patients smiles and oral function with dental implants at Cranbrook Dental Care and can be reached for more information through his website. by: Dr. David Banda at August 15, 2018 .